I had some leftover spaghetti squash from last night and had found this recipe with noodles, and thought – what the heck – let’s use the spaghetti squash for the noods instead! 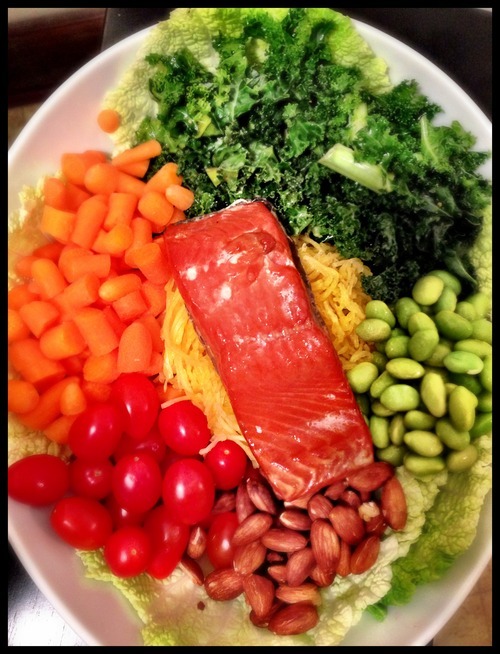 This salad is wide open really – you can add anything in it – I went for tomatoes, toasted almonds, edamame, carrots and olive oil infused kale. You can go with radishes, mushrooms, scallions, sesame seeds – anything else you can dream of! Pack it full of goodness. I plated like this for the pic, but you can mix it in with the dressing. Also, depending on how much you use in the salad, you might need to make more dressing. I fiddled with the dressing and added honey and 1 packet of stevia to give it a little sweetness. Just mess around until you find the right balance for you! Salmon is optional of course, but oh so good! Whisk the dressing ingredients together and set aside. Toast your almonds if you want them toasted at 350 degrees for 10 minutes or so. Cook your shiitakes if you’re using them. You can bake them in the oven – slice and toss with a good glug of olive oil and some salt. Bake in a 350 degree oven until crisp and slightly charred (about 25 minutes). Alternatively, you could cook them down in a pan with a little bit of oil & salt or soy sauce. (about 10-15 minutes). Stir only occasionally. Cook the noodles according to package directions or if you’re using spaghetti squash – prepare it in the microwave or oven. Google it if you’ve never done it before! . Place the noodles in a large bowl and toss with the kale, cabbage, carrots, radishes, shiitakes and toss with most of the dressing. (Let it all sit and marinate for awhile while you clean up the kitchen). Add sesame seeds, then taste and adjust. Add more dressing, soy sauce, lime and/or sriracha to your liking. Serve chilled or at room temp. Store leftovers in the fridge. Pack in to-go containers and bring to work. Prep your kale by drizzling it with a little bit of olive oil and a few good pinches of salt. Massage it well with a your hands until it wilts down quite a bit. (If you make kale salads, you’re already familiar with the method). The leaves will become softer and less raw tasting.